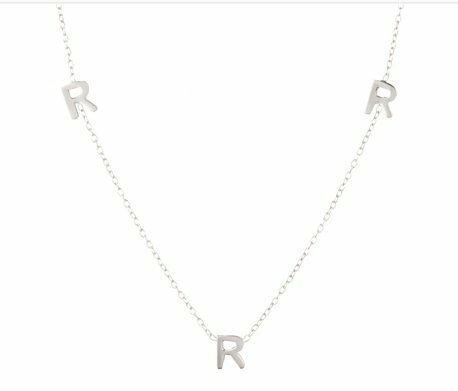 We love the letter necklaces. One letter - two or three - we will space them out on the necklace for you. We offer this necklace in your choice of 16 ,18, 20 or 22 inch length. Design it how ever you wish! The necklace shown has two initials and is 18 inches long. Choose from either gold plated, sterling silver or rose gold plated. We have the option for you to do one letter. If you would like up to three different letters please add all three in the order you would like in the comment section. We will start on one end of the necklace and move around for example DET - we will do three different letters. Most enjoy the single letter. The letter will be off centered to show on the side of the necklace. Letters are up to 1/4" in size. For more than one letter please note in the comment section. We can do up to three initials. Please put a comma between the letters. Price: $76.00 In stock! - Browse this brandOur products are custom made to your specifications. This product ships up to 3 weeks after your order is placed.